I recently attended the Ambiente Fair in Frankfurt and while it was hard work (I walked an average of 12K each day) and there were a lot of brands exhibiting, I have really enjoyed the Fair and discovered many new Designers and companies that made my heart skip a beat, so in the end, all these steps and aching muscles were worth it. My top three favourite stands were Brands and Designers I had never heard of before and who also represent the trends for textures and shapes I spotted in Ambiente. 1/ Ceramic Designers: Kaas + Heger, a husband and wife team who have been Ceramist for 30 years in their own right and joined forces in 2016 to create their first tableware ceramic collection. Each piece is beautifully handmade using one local clay and natural pigments to achieve these beautiful, complementary earthy hues. A ceramic collection that will add warmth and textures to the most minimalist interiors. 2/ Concrete being one of my favourite materials to use in interior design, I was really impressed by the smooth, tactile and minimalist range of accessories for the home in eco-friendly concrete launched by Danish company Like Concrete. Like Concrete’s collection includes coat hooks, planters, lighting and serving trays (featured below in an office environment but I’ll be using mine in the bathroom to display my skincare products and in the kitchen). 3/ Last but not least was the amazing, minimalist led lighting designed by Israeli Designer Itai Bar-on. I quickly took a picture of Itai’s stand on my way to Ambiente’s trends conference on my first day at the fair and posted it on Facebook. That poor quality image got shared 24 times!!! I have fallen so much in love with Itai’s work and kind, positive personality, that I went back to his stand several times to talk to him and his brother but I will dedicate a whole post to Itai’s work in the near future. So, let’s see what is happening in the world of interiors and design with textures and shapes. While, some companies have designed their collection around THE colour of the year (and sadly this year’s Pantone’s colour of the year UltraViolet is my worse nightmare), it was interesting to see that several design companies from Japan, Denmark and even Russia made their own rules, exploring hues that have an earthy feel: black, brown, sand and grey and shapes that feel organic and minimalist proving that minimalism doesn’t have to be cold. Textures and earthy hues were beautifully embodied by the rough surface of the unique FCK collection designed by Frédérick Gautier for Belgium company Serax. Made of cement stoneware, the FCK collection is a tribute to architecture and the many materials (water, earth & sand) that have enabled humanity to survive by inventing mortar, cement, and concrete. 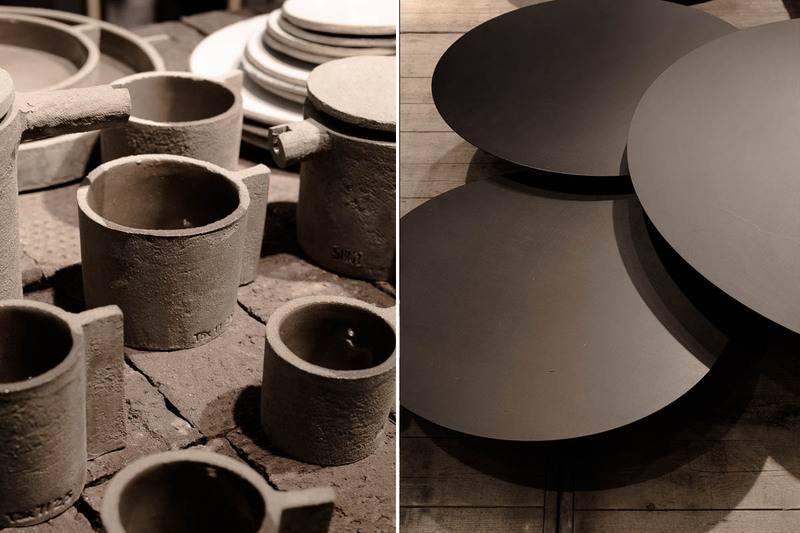 From the teapot to the cup and plates, each piece is unique and based on elementary forms: cylinders, columns, cubes, cones, discs. Frédérick Gautier’s “Vases à arroser” are inspired by floating bollards. Fascinated by this object, he studied it in great detail, disassembled it and put it back together in hundred different ways until four vases remained. Each vase is a minimalistic water reservoir that reflects the opulence of the flowers when it is filled, just as the water in the locks, reflects the houses alongside the canals of Paris at high tide. RO, a Danish design company launched in 2013, prioritizes craftsmanship and aims to create objects in a sensual manner to provide a much-needed contrast to the fast and constantly changing world we live in. I didn’t know about them but I was really wowed by the organic, sensual feel of their collection in soothing hues and natural materials. Elementary shapes (cylinders, columns, cubes, cones, discs) found in Gautier’s FCK collection for Serax is something we also found in the work of Kristina Dam. A Danish Designer whose work I encourage you to discover, Kristina Dam makes beautiful, timeless objects and furniture using strong materials like solid oak to ensure longevity and durability. Her product portfolio consists of furniture, sculptures, decoration items and illustrations and each piece has the ability to add a sculptural and graphic touch to interiors while the grain of the material used (solid oak, beech) add textures to a simple, pared-down interior. The new outdoor furniture collection by Belgian Interior Designer Béa Mombaers for Serax also features a mix of textures, shapes and earthy colours. From cement trays, bean bags, graphic black steel coffee tables & wall racks to outdoor sofas, each object creates a visual statement in every room even outdoors. And here is the end of my round-up on textures and shapes spotted at the Ambiente Fair in Frankfurt. I have written another article about dining and table settings on the Ambiente blog which you can read here and you can also watch the Live Facebook Video I did with the Ambiente team, where I take you around some of my favourite brands. Personally, I noticed that these past few months since I painted the wall of our lounge in grey, I have gravitated towards more of an earthy feel introducing objects with textures and slowly moving away from the Scandinavian all-white look. Disclaimer: This article is sponsored by Ambiente Fair.